December 5, 2017 – A team of soil science researchers in the UBC Faculty of Land and Food Systems were recently awarded $1.8 million in funding from Agriculture and Agri-Food Canada (AAFC) for a research project that will provide local farmers with information on the greenhouse gas emissions of their crops. 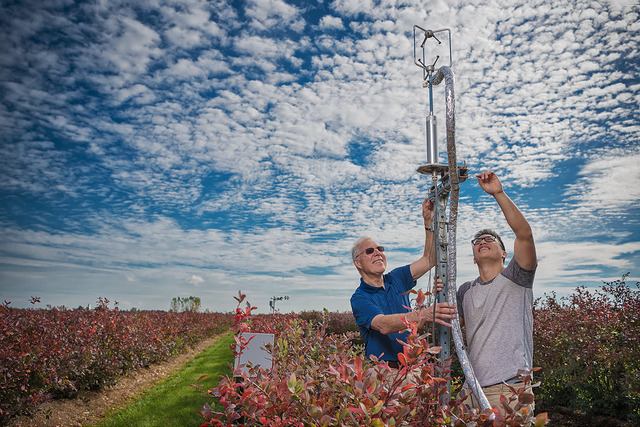 Andrew Black, Sean Smukler, Rachhpal Jassal and Maja Krzic will measure the greenhouse gas emissions from blueberry, potato and forage crops on farms in BC’s Lower Fraser Valley. The team will collaborate with researchers at the Pacific Agri-Food Research Centre at Agassiz and personnel with the BC Ministry of Agriculture, the Delta Farmland and Wildlife Trust, and the Delta Farmers’ Institute. The results of this research will be shared with Canadian producers, policy makers and the scientific community in order to help reduce the climate impacts of these systems. Funding for the five-year project, “Quantification and mitigation of greenhouse gas emissions from high value agricultural production systems in British Columbia,” is provided from AAFC’s Greenhouse Gas (GHG) Program.